The conviction and sentencing of Trace Adams is a stark reminder of unfairness of Texas justice when it comes to the prosecution of steroid crimes. The State of Texas undoubtedly has some of the most draconian steroid laws in the world and local district attorneys aren’t afraid to exploit them! Adams was convicted of two counts of intention to distribute between 28 and 200 grams of anabolic steroids by a jury of his peers in Victoria County, Texas on July 13, 2017. The fact that Adams was found guilty may not be surprising. After all, police busted him with steroids in his possession during a “routine” traffic stop. He may have been more deserving of a possession charge rather than a distribution charge but the fact that he had steroids in his car seems indisputable. However, most people will be shocked at the penalties permitted under Texas state law for steroid-related crimes. Victoria County Assistant District Attorney Jacqueline Johnson aggressively pursued a 50 year prison sentence as the appropriate penalty for Adams’ dalliance with the muscle-building drugs. Yes, 50 years in State prison! Fortunately, the judge rejected such a patently outrageous 50-year sentence and sentenced Adams to 10 years imprisonment. Certainly, Adams’ 2010 conviction and prison sentence for possession of pseudoephedrine to manufacture methamphetamine in a make-shift meth lab in his girlfriend’s trailer didn’t help his case. But 10 years in prison for the possession of such a relatively small quantity of anabolic steroids still seems excessive. As far as Texas justice is concerned, Trace Adams should probably consider himself fortunate. It could have been far worse. 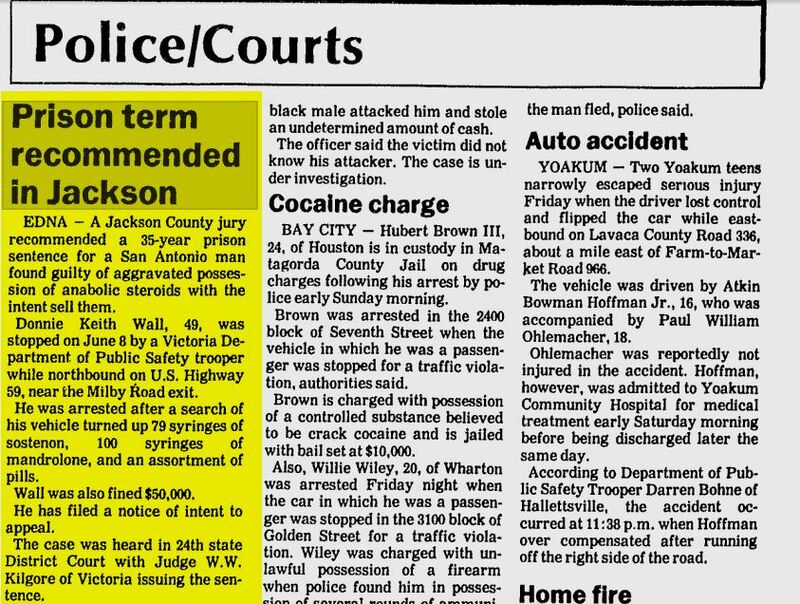 The most disturbing example of Texas justice for steroid users occurred in 1992. Donnie Keith Wall was sentenced to 35 years in prison and fined $50,000 for aggravated possession of 200-400 grams of anabolic steroids with intent to sell by State District Court Judge W.W. Kilgore. And 35-years in prison wasn’t even the maximum possible sentence. Wall could have been sentenced up to 99 years in prison for this steroid crime. The most obscene observation regarding Wall’s sentence was the fact that he only had a personal supply of steroids in his possession. Like Adams, Wall was busted in possession of steroids during a routine traffic stop. Wall had just enough injectable steroids for a nice 16-week steroid stack comprised of 1,250 milligram per week testosterone plus 300-milligram per week Deca Durabolin stack with a few oral steroid pills thrown in. He obtained pharmaceutical quality steroids from a Mexican pharmacy. Police seized 79 Organon Sostenon 250 redi-jects and 100 Organon Deca Durabolin redi-jects. The stack would have represented an aggressive 25 gram steroid cycle. You may recall that Wall’s conviction supposedly involved 200-400 grams of anabolic steroids. It didn’t. It only involved approximately 25 grams. Wall’s conviction and sentencing was based on the total weight of the active ingredients plus all fillers, excipients, carrier oils, solubilizers and bacteriostatics used in the solution. the “adulterants and dilutants” were specifically added to increase the potency of the steroids. Wall lost his appeal. The appellate court accepted the testimony of the State’s expert witness as fact and affirmed Wall’s conviction and 35-year prison sentence. They really mean it when they say “don’t mess with Texas”.